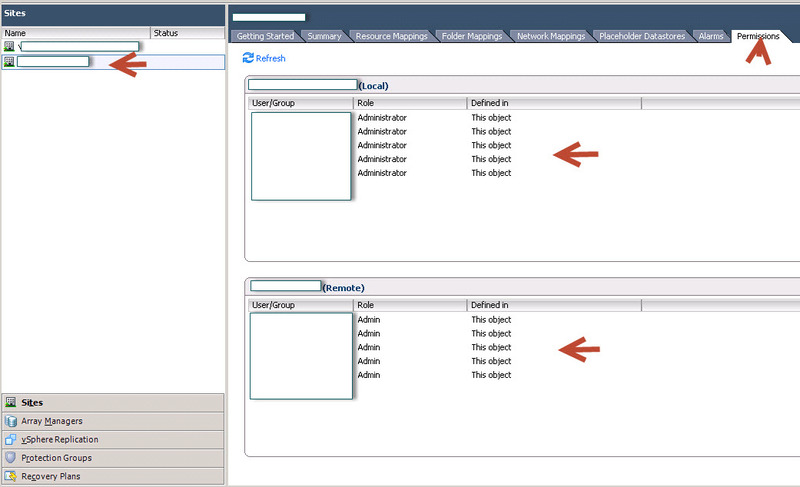 One of the things that is not obvious about SRM is what type of permissions is required for account used to run SRM.Most of the documentation notes that you need Administrator in vCenter for SRM for at least pairing, but there is a lot of focus on roles and not the service account. 1)Account entered during SRM install: This account needs administrator rights on the corresponding vCenter in order to register with vCenter and for normal operations. This account is used if you want to run commands on the SRM server during a recovery and you require specific rights granted by AD. This may include updating DNS entries or running scripts against other servers. To change SRM to run as as service account, go to services, right click on the SRM service and change the account from “Local” to the service account of your chooseing, Restart SRM. This account does not necessarily need to be a member of the local Administrators group, but I preferred to have it there. For my case, it’s redundant since I have the service account as a member of an administrator ad group. SRM provided new permissions to assign to existing roles and sample roles for common tasks. That being said, use the account that you normally login to vcenter with. When you open up SRM you will be asked for credentials to the alternate site. Use the credentials that are assigned SRM privileged in the alternate vcenter. Often (within the same company) this will be the same account you logon to the first vcenter with. I’m hoping they let you SSO with the first credentials, providing the same account gets old. OK, now that permissions are out of the way, here is the issue that I ran into. I was able to pair the two sites together with my regular account from site a but not from site b. with the service account I could not pair either way. My account was a vcenter admin and I added SRM as a vcenter admin so I was confused. I also tried adding the a service account as a local administrator on the vcenter and the SRM server with no luck. Support was unable to determine the issue at the time at the time, but I spent a few hours googling after the family was asleep and I ran into this Kb. It appears that SRM stores the administrators that have SRM access into the database. For some reason, this database was not in sync with what was on vCenter. Also on the Permissions tab in SRM, it did not show individual entries, it stated that permissions were inherited from vCenter and were not individually listed (at least from what I recall). Following the KB, I cleared the entires in the two tables on both SRM DBs and restarted services.